A giant airship which can stay airborne for weeks at a time could take to the skies next year after the British government handed the project a multimillion pound grant. 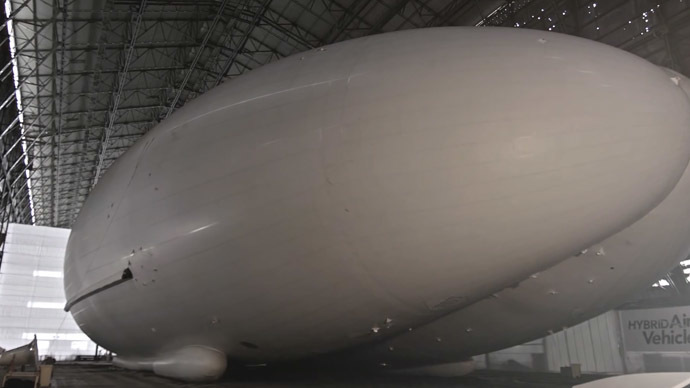 Hybrid Air Vehicle (HAV), the British company which designed the Airlander 10, received a £3.4 million grant from the UK government to get the airship off the ground. Inspired by the great airships of the 1920s, including the ill-fated Hindenburg, the Airliner 10 was originally design to be used by the US Army for surveillance missions. After budget cutbacks stalled the project, the British firm bought the aircraft back from the US government. The UK plans to use its new acquisition, which is capable of carrying up to 20,000 pounds (nine tons) of cargo for up to five days without landing, to transport freight around the world. It is estimated that running costs for the giant aircraft are 10 to 20 percent less than a helicopter. Spanning 302ft (92 meters) in length, the Airlander 10 is the longest aircraft in the world. It’s based at Cardington in the only air hanger big enough to accommodate the 113ft (34m) wide and 85ft (26m) high vehicle. Unlike zeppelin airships of the past, the Airlander 10 has an aerodynamic cambered shape which allows it to create lift like an airplane wing. This unique design enabled engineers to make the machine heavier than air, so ropes aren’t necessary to hold it down. The enormous aircraft is powered by four turbocharged diesel engines. Some commentators have highlighted the craft’s resemblance to a large posterior, from certain angles, leading to amusing comparisons with socialite-model Kim Kardashian’s famous endowments. HAV hope the model will eventually lead to the construction of the Airlander 50, an airship able to transport 50 tons (110,230 pounds) of cargo. UK Business Secretary Vince Cable announced the multimillion pound government investment on Friday. “The growing aerospace sector has the potential to generate thousands of new jobs and billions of pounds to the UK economy in contracts,” he said. “As part our long-term industrial strategy we are jointly funding £2 billion of research and development into the next generation of quieter, more energy-efficient and environmentally-friendly planes. Fans of the Airlander 10 include Iron Maiden lead singer Bruce Dickinson, who has personally invested in the aircraft. Speaking to the BBC, Dickinson compared the aircraft to Thunderbird 2 – a fictional aircraft from British children’s TV show ‘Thunderbirds’. “It will be able to cross the Atlantic and launch things right where they need to be,” he said.